On this date in 1901, Petrus Jacobus Fourie, Jan van Rensburg, and Lodewyk Francois Stephanus Pfeiffer were shot by the British at Graaff-Reinet. They were among the numerous subjects of the British Cape Colony whose sympathy with the independent Boer republics which Britain was in the process of conquering extended so far as aiding their Dutch brethren’s resistance. In this case, the young men joined the famed Boer guerrilla Gideon Scheepers — and whatever one might say about the fuzziness of ethnic and national identity in a frontier region, this rated in London’s eyes as rebellion. On July 6, 1901, Scheepers executed a raid on the town of Murraysburg — “Scheepersburg”, he called it — and put loyalist houses to the torch. The British Gen. John French sent columns of men into the rugged Camdeboo Mountains in an effort to trap the irksome commando. 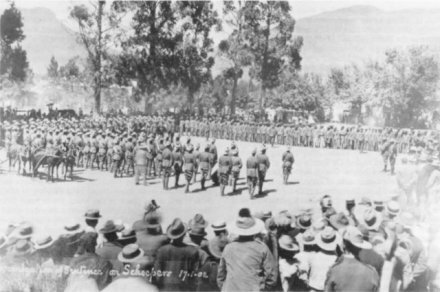 Scheepers and most of his troop of about 240 men escaped, but about 27 or 28 Cape Colony rebels were captured (along with a few free staters, who could not be charged as rebels). A particularly revolting incident happened in the execution of the three who were shot. This was, that the firing parties were a body of ten men, five with ball, and five with blank cartridges. 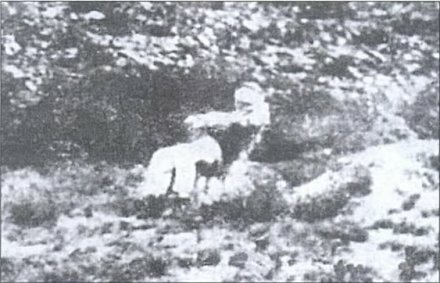 After the word “present,” which brings the rifle to the shoulder, one of them “‘pulled off” before the command “fire” was given, and the bullet blew off the top of one man’s head. 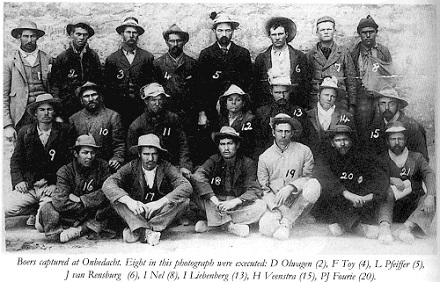 Eight of these people were executed as rebels over the ensuing weeks, with the aid of Jan Momberg, one of their erstwhile mates who turned Crown’s evidence against them to save his own life. After Fourie, van Rensburg and Pfeiffer were shot on Aug. 19, Ignatius Nel and Daniel Olwagen — both teenagers — died at Graaff-Reinet on August 26; and, Hendrik van Vuuren, Fredrick Toy and Hendrik Veenstra were shot at Colesberg on September 4. Though the British made an effort to obscure the final resting-places of these potential martyr figures, their graves were located. 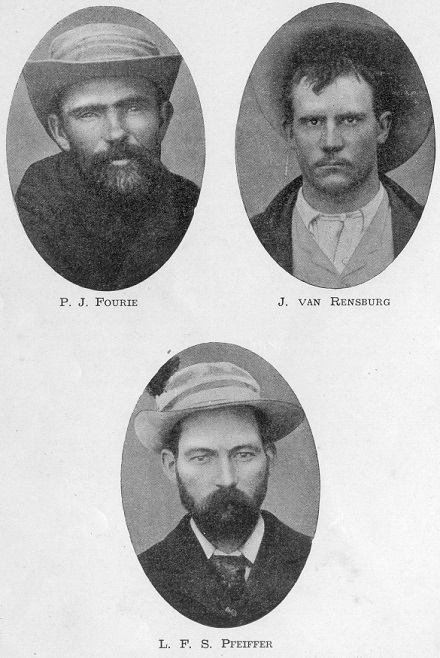 Fourie, van Rensburg and Pfeiffer, along with Ignatius Nel and Daniel Olwagen, are among the men subsequently exhumed and placed in a collective grave. 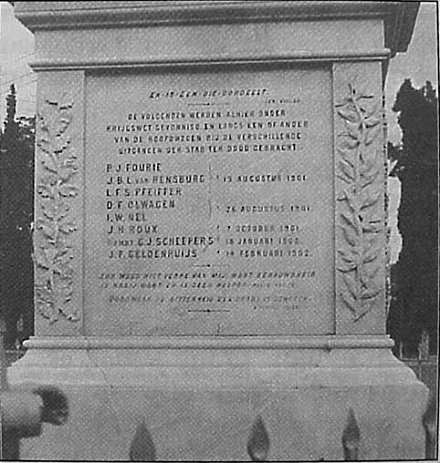 A monument in Graaff-Reinet honors these and three other guerrillas executed there … one of whom is Gideon Scheepers himself, who was captured in October of 1901 and executed the following January. There’s a good deal more about Scheeper’s rebels, and these men in particular, in a two-part article by a descendant of van Rensburg here: part 1 | part 2. 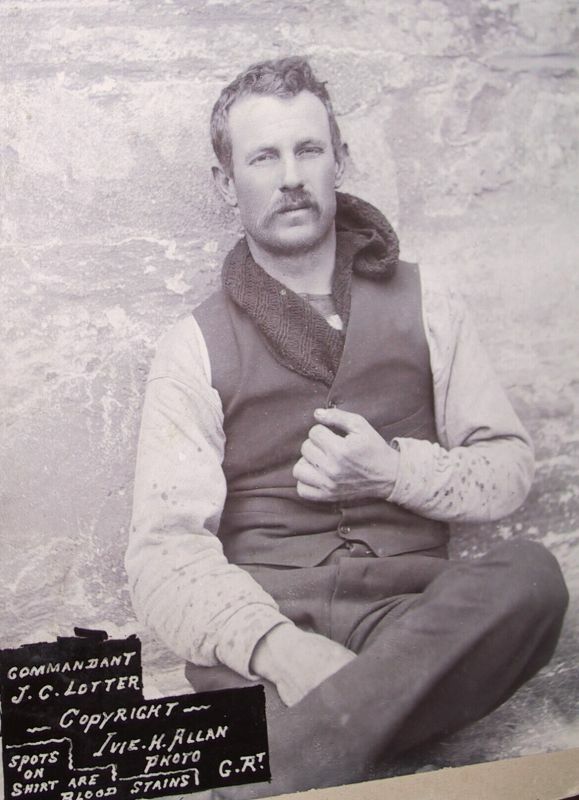 On this date in 1901, Commandant Johannes Lotter was shot at Middelburg. 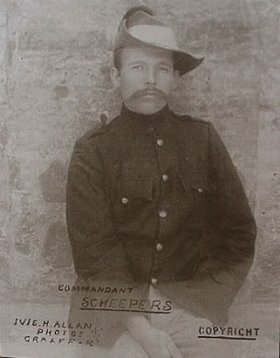 Along with Gideon Scheepers, Lotter is one of the most famed Boer guerrillas from the Second Boer War. Regarded by the British as one of their most nettlesome adversaries in that dirty guerrilla war, Lotter was captured in a bloody early September ambush when matters were well into an unpleasant scorched-earth endgame. This was cause for much slapping of backs among the Union Jack set, and earned for his captor an immediate promotion. 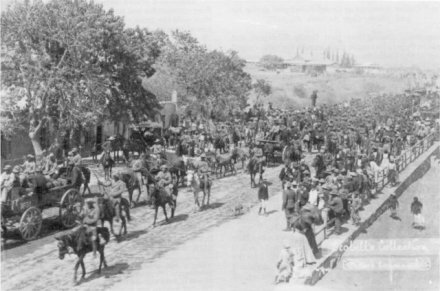 Lotter’s captured men being jubilantly escorted into Graaff-Reinet. And one other thing: sedition. 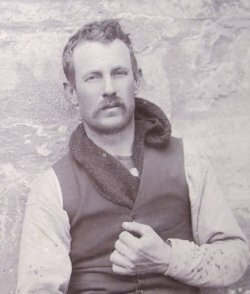 The British charged Lotter as a rebellious subject of the British Cape Colony — rather than a resident of one of the independent neighboring Boer states — who owed allegiance to the British crown; upon this premise things like “killing troopers in war” became “murdering troopers”. his Free State citizen document was in a small case, which was lost or destroyed theday of surrender. Witnesses for the defence gave evidence that they had seen these papers. British intelligence stated that it could find no proof of his Free State citizenship in Bloemfontein. Lotter responded by asking how he could prove his citizenship when all his witnesses were still on commando and that he had been granted no time to call upon them. Hey, the guy had six whole weeks from capture to execution to sort it all out. A “Chair Monument” — there’s a picture of it on this page — commemorates Lotter and his fellow commando Pieter Wolfaardt at the place outside Middelburg where they were shot together on Oct. 12, 1901. 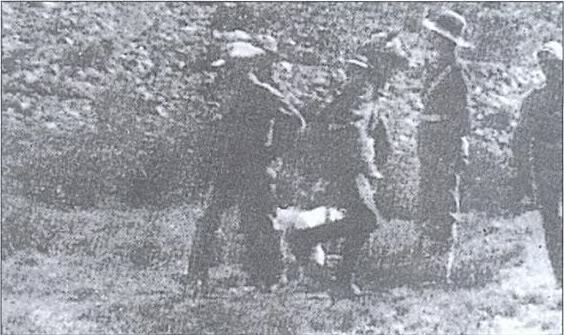 A number of additional prisoners from Lotter’s command taken with him in that same ambush were also eventually executed. * Specifically: murdering two native spies; killing three British soldiers; blowing up railway lines; and sjamboking loyalist civilians. ** When the British later captured Scheepers, who was unquestionably not a Cape rebel, they simply charged his similar conduct as war crimes to the same capital effect.